Eve Environmental Services: There Are Great Ways To Save On Office Cleaning Costs! To most employees, an office is considered as their second home. Because of this fact, these employees feel like they have the responsibility to take care of their offices as much as they would take care of their own houses. That responsibility reflects how they manage their homes including how they keep things in order and how they keep and maintain its cleanliness in all areas. To some, however, cleaning is not a priority because they cannot appreciate the effects of working in a clean and orderly office. Why is cleaning the office important? Basing on observations, the overall appearance of where one works has a great effect on the attitude of employees. This can be manifested in higher productivity at a lesser time and shows lesser conflicts among employees. This can also imply fewer sick leaves. This also makes a great impression to clients and visitors which eventually, will affect the total output of the office as a whole and be beneficial to the employees. How can cleaning be done? Cleaning the office would require time and effort. It will also take much responsibility on the part of employees. After all, they have to take care of their own workstations most of the time. In order to accomplish the task with flying colors and for them to achieve results, there are great ways by which you can save on office cleaning cost. These are elaborated further in the following subheadings. As mentioned awhile back, each employee should be made responsible for the cleanliness of his area. Simple tasks like throwing personal litter in properly marked trash bins and wiping their own tables can be done by employees. A clear-your-desk policy should be implemented. Through these, dust and clutter can be minimized. Have some doormats for employees to wipe their shoes on. There should be a designated area wherein they could eat their meals too. This should be strictly reinforced to avoid pest and rodents in the office area. If your office is frequented by many visitors and you have many employees, this is your option. Have your office cleaned on a regular basis to make sure that it is free from disease-causing microorganisms, pests and dust. Having your floors washed and your carpets buffed regularly will allow you to save more compared to hiring someone to get rid of molds, mites and pests. Besides, minor damages could also be spotted immediately. Consider a pay-as-you-go cleaning services if employees are always out on field as this method will not let you sacrifice payment for a cleaning service that is not being done. This holds true for offices that seldom need a cleaning job. Instead of paying for a fixed monthly rate, arrange for a cleaning service that allows you to pay after each service. Make use of materials that can be recycled. 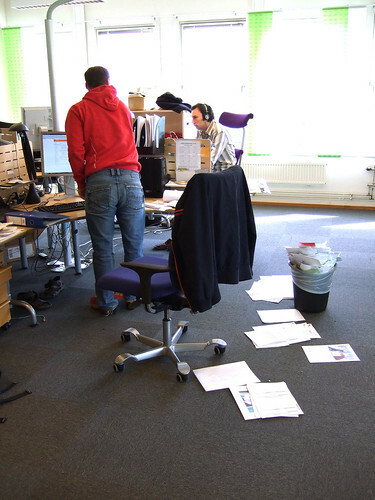 Paper is the most common litter in offices that makes up the bulk of trash bins and drawers. Encourage employees to reuse paper. Also, you may as your employees to go green when it comes to items that they use. This will minimize clutter in the workplace and will also work for the benefit of the environment. Many offices leave all the cleaning jobs to cleaning companies and this is done on a regular basis. Obviously, they do the sweeping, mopping, emptying of trash bins, window cleaning and vacuuming all the areas of the office. This will include the main office area, lavatory and pantry as well as waiting areas. All of these services are charged depending on the size of the office. Some ask for a flat rate and some charge for a fee per square foot. You better check on that so you know the services you are actually paying for. Asking the help of professional cleaning companies when it comes to having your office cleaned properly requires considering a couple of tips. First, you have to give high regard to the company's reputation. Hire the most reputable company in your locale. You should also be familiar with the services including among its list. You do not want to end up paying for extra charges on services that were not listed among the basic ones offered by the company. Last but not the least – it would be good to compare several cleaning companies and asking the help of other people within the organization, you can all finally decide on who to hire for this particular task. We are a reputable cleaning company in Adelaide that meets all the requirements your office will need when it comes to cleaning your workplace. Please feel free to contact us and browse our pages to learn more about our company and the services that we offer.